Workspace, storage and kitchen, all in one place. 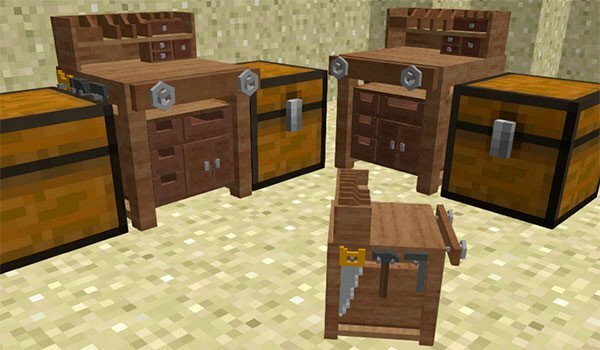 Werkbench 1.7.10 is a mod that lets you create a new crafting table, besides having a three-dimensional and detailed aspect, offers new features such as space normal crafting, plus storage space. This table assumes crafting new features if placed around trunks or furnaces. If we put a chest on either side of the new crafting table, on the same interface of the table, we will increase the storage capacity, thanks to the addition of the two chests. We may also post double chests to double capacity. If we remove one of the side boxes and put a furnace in the interface crafting table we can make crafts and cooking. How to install Werkbench Mod for Minecraft 1.7.10? Double-click on the Forge downloaded file to run the Forge installer. Crafting table with furnace and storage!